Former president and COO of Waffle House Bert Thornton shares secrets to success in new book. No one else is responsible for your success or failure. What happens or fails to happen depends strictly upon your action or your inaction. Waffle House, Inc., one of the largest 24-hour restaurant chains in the world, came to fruition more than 60 years ago, but one of the most iconic additions to the franchise came in 1983 with the creation of Bert’s Chili. With more than 11 million servings sold each year, Bert Thornton—the recipe’s namesake—is proud to bear witness to the stamp he’s made not only on the menu, but also on the business world in general. 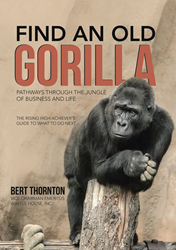 In his new book, “Find an Old Gorilla: Pathways Through the Jungle of Business and Life,” Thornton shares immediately applicable advice for readers on all ends of the career spectrum, whether they are just beginning or established and in need of a refresher. Thornton is adamant that effective mentoring is the key to success, for both mentor and mentee. “Find an Old Gorilla” details how to choose the right mentor, make correct career path decisions at certain points in life and outlines specific action steps to becoming a strong leader. Bert Thornton graduated from the Georgia Institute of Technology in 1968, where he attended on a full football scholarship. He then spent two years as an artillery officer in the United States Army, serving a tour in South Vietnam. Thornton joined Waffle House, Inc. as a manager trainee in 1971, where he ultimately ended up as the president and COO in 2004. Today, Thornton is now Vice Chairman Emeritus of Waffle House, Inc. and currently resides in Pensacola, Florida, with his wife, Kathy.